BioWare just released the texture artwork for Tallis' costume in the hopes that cosplayers and fan artists can use this resource for their projects. Anyone who shows up to BioWare's Dragon Age panel on October 15th at NY Comic Con with a completed Tallis costume will receive a prize for their efforts. Also, those who can tweet their fan art and/or photos to @dragonage with the hashtags #dragonage and #fanart will have an additional chance to win something. Deadline for Twitter submissions is November 1. 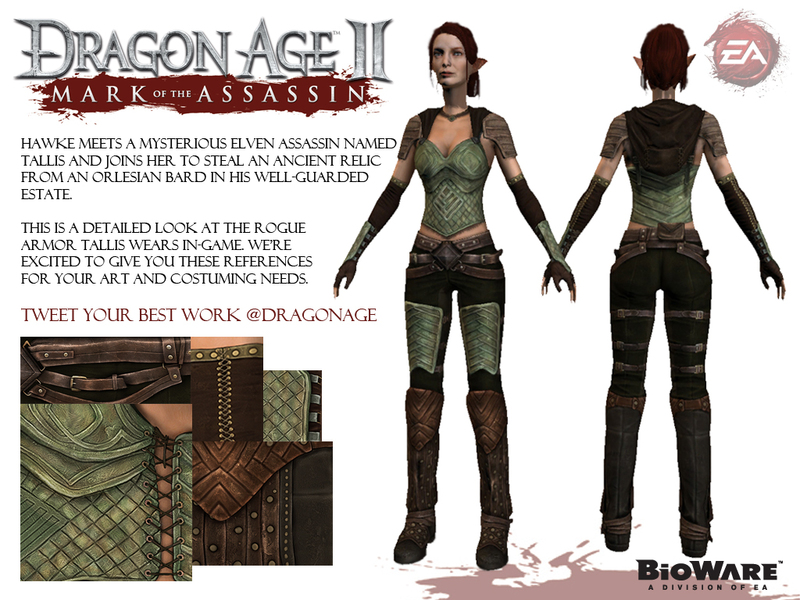 We'd like to reward our cosplayers and fan artists for their dedication to creating art in tribute of Dragon Age. Our designers would like to share this detailed look at Felicia Day's character Tallis to help with your efforts! We are happy to reward anyone who has Mark of the Assassin art/cosplay at our Dragon Age Panel at New York Comic Con (Oct. 15th at 5:15pm) with a surprise token of our affection. Tweet your Tallis art/costumes to @dragonage with hashtags #dragonage #fanart by November 1st for additional chances to win! The armor texture used for the Tallis DLC character. Greg Aronowitz, who created the original Tallis costume for the Dragon Age: Redemption web series, also did a writeup of his development process for the Tallis costume, complete with sketches and photos. Updated this post with a link to Greg Aronowitz’s blog article about the development of the original Tallis costume. Correction: For the NYCC portion of the contest submissions, you must show up to the Dragon Age – Mark of the Assassin panel on Saturday, October 15th in order to show off your art or costume and obtain a prize, not the booth. Saturday NYCC tickets are already sold out, and only 3 day passes are available if you plan on attending.